Munich - As a world, European, German and Italian champion, a UEFA Cup winner, record caps holder for the national team and former World Footballer of the Year, Lothar Matthäus is undoubtedly one of the most decorated footballers of all time. 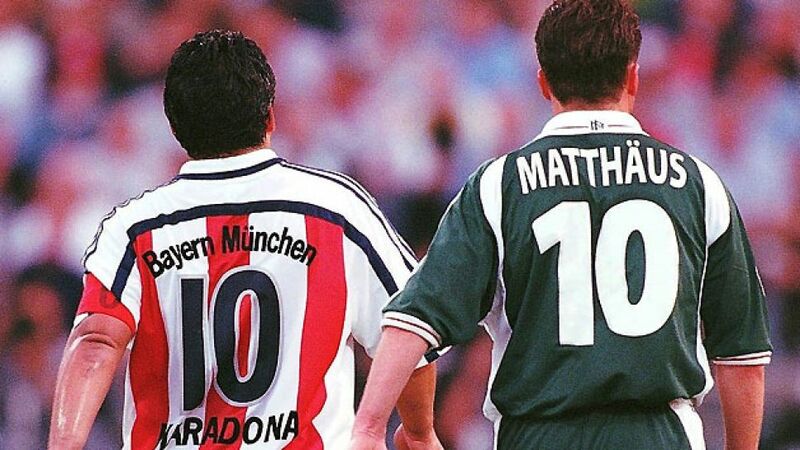 Many even considered Matthäus to be on a level with Diego Maradona as the world’s greatest player in his early-1990s pomp, his dynamic yet cultured play the more functional, and often fruitful alternative to the Argentinean’s born talent. The two superstars often crossed paths on the field of play, first in a 1-1 friendly draw between Germany and Argentina in Buenos Aires in March 1982, when Matthäus was handed the job of marking Maradona, a task he would again fulfil at the 1986 FIFA World Cup Final in Mexico, where, despite his best efforts, the Albiceleste ran out 3-2 victors. Matthäus’ moment came four years later, though, as the two nations once again contested the final, this time in Italy. While the declining Maradona was shut out of the game by Guido Buchwald, Matthäus ascended to greatness as Germany were crowned world champions for a third time. Born 21 March 1961 in Erlangen, Bavaria, Matthäus began his football journey aged nine with local side 1. FC Herzogenaurach. His performances soon began to turn heads and, at 18, he was snapped up by Borussia Mönchengladbach, a Bundesliga powerhouse at the time. Under the tutelage of coach Jupp Heynckes, the teenage Matthäus quickly broke into the first team, playing 28 Bundesliga matches in his first season and scoring four goals. It wasn’t long before the call came from then Germany coach Jupp Derwall, who selected Matthäus in his squad for UEFA EURO 1980 squad. With his side already 3-0 up against the Netherlands in their opening group match, Derwall introduced the 19-year-old, who gave away a penalty just six minutes after coming on. It proved to be his only appearance of the tournament, but still Matthäus could call himself a European Champion by the end of the competition as Germany held out for a 3-2 before going on to beat Belgium 2-1 in the final. An impressive 36 goals in 162 Bundesliga games for Gladbach were enough to alert the attentions of FC Bayern Munich, but before Matthäus left for pastures new, he had one final opportunity to bow out on a high, in the DFB Cup final, against Bayern. As if by fate, the match went to penalties. Matthäus blasted his spot-kick over the bar and Bayern lifted the trophy. Hardly the fondest of farewells. Matthäus spent four years with Bayern, celebrating three league titles and one DFB Cup triumph under coach Udo Lattek. After netting 57 goals for the Bavarians, the midfielder opted for a move to Italy, which boasted the strongest league in the world at the time. There, he developed into a truly world-class player, winning both the Serie A title and the UEFA Cup with FC Internazionale Milano under future Bayern boss Giovanni Trapattoni. Having recovered from a cruciate ligament injury, the 31-year-old Matthäus returned to Germany and FC Bayern in 1992. His success on the field continued right up until retirement in the year 2000, by which point he had reverted to the position of sweeper. Named Germany’s Footballer of the Year at the ripe old age of 38, he called time on his Bundesliga career after 464 appearances, choosing to wind down his career with the NY/NJ Metrostars in the USA following a calamitous group stage exit from UEFA EURO 2000 with Germany. Embarrassing though that tournament was for Germany, Matthäus crowned his international career with a 150th and final cap, making him Germany’s record appearance maker by some distance. Those caps encompassed a record 25 appearances across five FIFA World Cups, as well as a record five European Championships. Aside from the Champions League, which he came within seconds of winning on “that night in Barcelona” in 1999, Matthäus won everything there is to win during a glittering career which rightly ensures his place among the all-time greats of German football.